I often grab pieces of maps from Bing and Google maps and use them to create specific maps (for example, plotting the locations of all Microsoft buildings). Today I was curious to see what would happen if you grabbed the entirety of Bing's maps and printed them out, so I did the math. Bing maps' maximum available resolution is 10 CM per pixel, so if your screen is at a resolution of 1920x1080 pixel (minus the Bing toolbar and IE's toolbar), you can see an area of approximately 192 by 83 meters (576by 249 feet). If you were to grab a picture of the entire US at that resolution, your resulting image file would be approximately 50,000,000 by 19,330,000 pixel. Using the common "megapixel" scheme of representing picture sizes, we're talking about approximately 966.5 Gigapixels! Naturally, no single computer would have enough memory to handle such a file, but if you could, and If you saved such a thing as a JPG with a medium compression level, the resulting file' size would be at least 40270833 MB (which are 40 TB). If you were to go and print this file at the standard high-quality print resolution (300 DPI), you would find yourself with a print that's 4234 by 1636 meters (2.6 by 1 miles). And finally, if you're interested in generating a JPG image from the maps, here is a guide to doing that. If that's not enough, here is a list of several other tools. The Kindle Fire 7” tablet is one of the cheapest tablets out there. With the newer 8” version dubbed “Kindle Fire HD” out and about, you can score the previous model for less than $80. Despite the small size, when held by the hands (say, while lying in bed), it provides a screen-size equivalent to that of a 50” TV, which means it’s an excellent way to watch your favorite shows. If, like me, you have a home network with your favorite shows and movies stored on a central computer, you might be interested in streaming the shows from it to the kindle. With the Kindle being an Android device, it’s not designed for this, but with a little bit of work, it can be done. The first step is to gain access to your Windows Network, so you can view the files on the file server over the network. For this, a simple and free application exists – ES File Explorer, which you can find and install from the Kindle app store. Once installed click on Local on the top-left, and change to LAN. Define your shared folder and you’re ready for the next step. Next, you need a movie player that would be capable of playing as many possible formats. A good tool for this is RockPlayer. The challenge with RockPlayer is that it’s not a free application, and it’s also not available on the Kindle App Store, so it requires “side loading”. Now, to play a movie, use ES File Explorer to navigate the network to where the file is, and touch the file to open it. The Kindle might ask you which app to use to open it, so simply select RockPlayer, and the file should start playing. When RockPlayer is opened like that (by association), it will work straight away without any nags. If, however, you open it from your app menu, it will display a purchase window and ask you to buy it. You can do so and pay with PayPal, and the cost is just $10, which is really low for something as useful and reliable. Please consider paying it to support the application developer! And lest I forget...the kindle fire is great, but an even better solution for this sort of thing is the Microsoft Surface RT tablet series. With Windows built into them, you can connect to your network and watch movies without any apps, side-loading or configuration. It's definitely a better, albeit expensive solution. When chopping stuff for cooking, a particular nag is when stuff clings to your knife, esp. stuff like herbs. Most of us just wipe it with our fingers, but that’s not only dirty, but also dangerous (passing your fingers so close to the blade). Here’s a method for creating a knife-squeegee that can help. 1. Start with a piece of plastic. Polycarbonate looks best, but others are fine too. A small piece that’s about 8”x6” costs just a few dollars at Lowe’s or home depot, and would suffice for dozens of these. 2. Get a plastic cutting knife. These would also be available at Home depot, closely to where the plastic sheets are, and should be a few dollars. The plastic knives are weird, but don’t try this with a regular snap-knife. That’s hard and risky. 3. You’re going to need to cut the plastic into a strip that’s about ½” wide, and about 3-4” long. To know the exact length, measure the width of the blade at the widest point (typically, close to the hilt), double it, and add 1/2”. A typical 6” chef’s knife would be about 1.5” wide, so you’ll need a plastic strip that’s about 0.5 x 3.5”. 4. To cut the plastic, hold it flat on the table, and using a metal ruler, cut it by pulling the knife towards you. You’d need to repeat the cut about 10-15 times to score the plastic deep enough to allow it to break smoothly. 5. Once scored, place the plastic on the edge of a table, and apply pressure to break it along the score line. 6. Heat the plastic in the middle, so you can bend it. You can do this easily with a soldering iron (hold the iron close to the plastic, but don’t touch it, as it would stick to the iron). Another way is to place two ceramic tiles on a heat source like a stove, with a small gap between them. Then, place the plastic across. The heat will go between the ceramics and heat the plastic in the middle. Depending on how strong the heat source, the plastic should be bendy enough within less than a minute of heating. Don’t heat for too long, as it could cause it to “boil” (ugly bubbles appearing around the heated area). 7. Bend the plastic around the blade, but not too tightly. Ideally, you should have a bit of space at the top. 8. Remove the plastic quickly, and “close” it with your fingers, so that when it solidifies, it will be closed. That will allow it to cling to the blade. 9. Slide the new plastic on to the blade, and keep it there during chopping. When you need to clean the blade, simple slide the squeegee forward, and back. While most software is available for download these days, some stuff still requires media. Most notably in that category is Clip art. For example, the 500,000 clip art explosion collection by Nova takes up no less than 20 GB of data, and that’s not feasible for downloading. Even with physical media, we are still talking about 3 hefty DVDs, which means that every time you want to open a file from the collection, you have to insert the appropriate DVD. This is a hassle, to say the least, and if you don’t have a physical drive (my laptop doesn’t), that’s darn right impossible. If Nova’s software was decent, you could simply copy the content of the discs to your local hard drive and point the catalog tool to it, but that’s no possible either. However, there IS a way around this, thanks to Windows’s ability to mount ISO images as virtual drives. The idea is to take the content of the DVDs, and convert it into an ISO file, and then mount it as a DVD. An ISO file is a special file structure that packs the content of a CD, DVD or Blue-ray disk into a single file, and as I said, Windows can natively “mount” such a file to behave and look just like you had a physical drive with the original disk in it. 1. Disk 1 is just the catalog, and once you install it, you can discard the ISO to free up 3 GB of space. 3. The image catalog browser looks for the disks based on volume label, so when creating the ISOs, make sure you specify them as part of the process. The labels are “AE DVD 1”, “AE DVD 2” etc. There’s no shortage of info and articles about pickling on the lovely internet. Why am I bothering to write one too? Well, all too often, I see a common misconception, where people make pickling seem a lot harder than it should. Perhaps it’s just that some people are misinformed and haven’t bothered experimenting and exploring, and perhaps it’s some desire to make it more “professional” than it truly is. The reality is that pickling stuff can be really easy and quick. You can have a nice jar of pickled cucumbers with just 10 minutes of work, and 4 days of waiting (not 3 months or a year, as some would lead you to think). 3. Knife, to cut things down to size. You can’t really put a 12” cucumber in a jar, so it’s best to seek out small cucumbers. These are rarely available at stores, but can usually be found in Farmer’s markets during the summer. Typically, these are very cheap – around 2$ a pound. Another type of cucumbers that are suitable for pickling are sometimes available at QFC and Costco. These average about 6” in length, so 5-6 of them fit nicely inside a standard 1 Qt pickling jar. It’s also possible to cut regular large cucumbers to slices or strips and pickle those. The hot peppers and Garlic are optional – they are mostly for taste, and if you don’t like this particular taste or prefer another, that’s perfectly fine. Some people like to add lemon wedges to the jar, and others like other spice combinations. Depending on your preferred spiciness level, you might like to use Serrano or Jalapeno peppers (like me), or something stronger like Habanero or even Ghost peppers. Mustard seeds should also be available in any supermarket, usually in a little can or jar that would last for many pickling sessions. The Dill needs to be fresh, and that’s often sold in bunches that would be enough to 3 or more jars. Some people say you need to use the flowering dill bunches, but that’s not true, and any regular dill would do. The vinegar is important, but it can radically affect the taste. If you use White vinegar, that’s OK if you don’t put too much in…but I recommend a milder type like Rice vinegar. A typical $3 pack of dill suffices for 4-5 jars. 1. Put a teaspoon of mustard seeds in the jar. 2. Put a teaspoon of peppercorns in the jar. 3. Put the cucumbers in the jars, and try to pack them as much as you can*, leaving about ½ inch at the top for the dill. 4. Optionally, add garlic cloves, hot peppers, lemon etc. I recommend slicing whatever you add to enhance the flavor. 5. Boil water in a kettle – you’ll need at least a cup per every jar you’re pickling. 6. Add salt to water (1 teaspoon per cup of water) and stir well. 7. Pour into pickling jar slowly until everything is covered. If you pour it too fast, the glass might crack. You might also consider warming the jars ahead of time with warm tap water to reduce the risk of this happening. 8. Fold a bunch of Dill and place on top of the covered cucumbers. 10. Let stand for 4 days inside the house, in a place that doesn’t get cold. 11. Open and taste. If the cucumbers are ready (to your taste and opinion), put the jar in the fridge to stop the pickling process. 12. After a day in the fridge, you can move the jars to a cabinet or some other storage place, where they should be fine for many months (in theory, even years). I personally feel the pickles are enjoyable even after 3 days, but an extra day makes them a tad better. Heat facilitates the pickling process, which is why we use boiling water. On the other hand, cold stop it, so make sure the jars are stored indoors. If you are in a hot area, you can also place them outside in the sun – this makes the pickling go even faster…as fast as a single day! * Packing the cucumbers is not mandatory, but if you don’t, you’ll need a lot more water to fill up the jar. By querying the event log (with powershell, for example), you can produce a report that lists which sites are getting suspended often. Another type of information you might need is knowing how many of your sites are actually suspended throughout the day. This info can be achieved by examining the Private Working Set Size, which indicates how much memory a process is using. A site that is suspended will typically consume 2-6 MB, while an active site would consume at least 8 MB. Based on these figures, you can establish your performance data for peak and off-peak hours, and plan your expansion and hardware budgeting properly. These are pretty simple – they are composed of two parts, which snap together around the doorknob. This rotates freely, so the kid cannot open the door by twisting it, and to actually twist the knob, you need to insert your fingers through the side-holes and apply pressure. A child doesn’t have large enough hands for this, so that worked pretty well…for a few days. Indeed, it only took a few days for my junior hacker to figure out that by tugging on this, he was able to unclasp the plastic latches that keep this thing together, and as a result, it comes apart, revealing the knob and allowing him to open the door. What to do? Since then, no more break-ins…or break-outs! There are probably hundreds of articles and lists of what to do in Seattle, but I’ve yet to find one that’s complete. When my friend Micky asked for a list due to a family visit, myself and other friends helped him build the following list. Here it is…hopefully for posterity. Current update: July 2015. BlogSpot seems to be lousy at working with tables, so you can download the below as an Excel table (which also allows you to sort or filter the results). Click HERE to download it. Alternatively, to view all columns (incl. price range and more), select the page and copy it into Word or some other rich text editor. Dress well, cold wind on the water segment. Every September. Rides cost extra. Very large museum. Many full planes on display, inc. SR-71, Space shuttle body. Cheap parking. Park there, walk around downtown. Music, Science fiction and other cultural exhibitions. AKA “EMP” museum. No software or hardware sold to the public, but plenty of Microsoft branded items like shirts, bags, office toys. Renting a gun for the range requires a buddy to come-with, or bring your own gun. Huge store for drinking fans. Frequent wine tastings. Lots to do. Takes ~4 hours to get there. Lots to do. 2.5 hours by plane. Snow almost year round. Might be dangerous in Winter. Large mall, and with the adjacent strip-mall area, its HUGE. Check out the Wall of GUM! Parking is difficult and expensive. Buy 4-5 loafs of wheat bread at Safeway beforehand to feed the animals. Great Wolf Lodge water park and hotel Grand Mound (STS) https://www.greatwolf.com/grand-mound From $180 with Groupon Price is for a room, including waterpark passes for the whole family. free You can’t really see it from the street, but there’s a decent view from Argosy’s “Lake Washington Cruise Tour”. The container store Bellevue http://www.containerstore.com/ Store Something for anyone! Snoqualmie casino Snoqualmie(ETS) http://www.snocasino.com/ Casino Close to Seattle, gambling, food and shows. Arms Collector gun show Monroe, Puyallup http://washingtonarmscollectors.org/ $9-10 Alternates every 2 weeks. Puyallup is HUGE. Vuecrest Neighborhood Bellevue NE 8th St and Park Rd (covers 92-100 Ave NE, NE 8th-14th St) Neighborhood Astounding houses, botanics and gardening. This year, I decided it’s finally time to see the San Diego Comic-con…the largest comics, sci-fi and fantasy convention in the world. For many years I’ve yearned for it, and wasn’t able to go for various reasons (mostly since I didn’t live in America), but this time, things aligned just right…or so I thought. After my wife and I worked out the terms of my parole, I bought some plane tickets and found a nice hotel that was reasonably priced (the Bristol at $164 a night), signed up for membership as guided by the Comic-Con website and waited for ticket sales to be announced. However, as I learned the hard way, the demand for comic con tickets far outweighs the supply and every single ticket sold-out within less than 2 minutes. It was generally reported that they sold out in 96 minutes, but in reality that’s just the time it took to complete the financial transactions with the 100,000+ buyers. If you tried to go on the sale page after 9:02 that morning, you got a site-full page and that was it. I was at a place with a bad internet connection, and by the time I was able to login, it was too late. Naturally, I was heartbroken. Not only did I miss my one-and-only chance to go, I was also stuck with a $300 plane ticket and $900 hotel, both non-refundable. However, there are other things to do in San Diego, so I decided to go anyway…very smart move, as it turned out. At San Diego, I did the various attractions (I highly recommend the USS Midway and the Seal tour) and on Thursday (the 2nd day of Comic Con), I decided to go to the convention center and check it out. I wouldn’t be able to get in, of course, but I figured I’d at least see some nice-looking geek girls. I was right about the 2nd…but not so about the 1st. As it turned out, starting around 4pm, many people lined up the streets and offered their badges for sale. After some haggling, I scored one for $20 and spend the rest of the day at the convention. The next day (Friday), I went on CraigsList San Diego even earlier and scored a Friday Badge for $30 (it was earlier in the day, so worth more). The seller was at Comic Con himself, so we met at the entrance to the hallway and he sold me his spare badge. So, not only did I successfully GO to comic-con, but I also scored the badges for under their original price (which was $40). In addition, I got the badges without standing in any lines, while official ticket holders took many hours to convert the online registration to a physical badge. I’ve been told people lined up as early as 5 am for that, while those who showed up at opening times waited in line until almost noon just to get in. You might be wondering how is this possible? As is well-known, Comic-Con takes various measures to prevent ticket-scalping! Well, this is true, and a ticket buyer can receive a badge only by showing an ID matching the name she or he used to purchase the ticket. The badge itself also has the person’s name printed on it. However, once that process is complete and you have a badge, the ushers who guard the hallways can’t really verify the identity of each and every entrant, and so anyone wearing a badge can walk right in without further scrutiny. Naturally, buying a ticket from a scalper ahead of the convention is a risk, because without an ID card matching the name, you’ll be denied a badge, so the trick is to get the badge itself…and that can only be done during the convention. I’m not going to say that anyone should go ahead and just fly over without buying a ticket, of course. There’s always a risk of not being able to find a used badge, or that Comic Con will figure out some way to screen everyone (as a security expert, I don’t think that’s feasible, but who knows…maybe they’ll develop retinal scanner a-la Minority Report…). Also, a down-side of this method is that used badges are easy to find only around mid-day and later, so the ROI (return on investment) is limited. However, this is an important lesson for anyone who wants to go and can’t deal with the messy ticket sales system. • Scalpers sell at inflated prices, and its not unusual to see a single day ticket offered at $250 or more. I don’t think it’s worth it when you can score a ½ day badge for $20-30 as I did. Your call, of course. • Even though it violates policy, there are no active steps against reselling tickets – at least none that I’ve seen. Scalpers and resellers stand around road-blocks near the convention center, typically holding out their badge with their hand to indicate they are offering to sell. • Selling your badge violates the terms and conditioned you sign when you buy the badge, so if you do it, you’re taking on some risk. Buying one, though, whether Comic-Con likes it or not, is not illegal and since you didn’t “agree” or “sign” anything, you are not risking any more than having the badge confiscated and yourself escorted out (which is very unlikely, as I said). I’m not a lawyer, so I can’t guarantee the above, but I’m fairly certain that buyers are in no legal jeopardy. • Before 4pm, it’s hard to find sellers on the street, but CraigsList should have plenty. Naturally, the earlier in the day, the more the badge is worth, so take that into account. • You probably don’t have what it takes to identify a forged badge, if you run into one. I can’t teach you how, I’m afraid, but it’s probably not going to be a problem, because the ushers don’t have the training and time to verify badges. They just glance at them quickly, because every usher has to handle about 5-6 entrants every second, and there are no “quiet times”. • On the same note as above, I doubt the ushers would be able to recognize or detain people who are ineligible (for example, carrying a badge from the day before, or even without a badge at all) under all the volume. I wouldn’t encourage it, given how easy it is to get a badge if you really want one, but if all else fails and you have nothing to lose…might be worth the risk. And finally, if you’re worried about my actions violating ethics or hurting comic con…well, I don’t feel bad about it at all. My badge was original and authentic, and if anything, the re-sale I was part in is better, because the thousands of dollars I spent at Comic-Con and in San Diego are an income for the vendors, income for the airlines, the city of San Diego and a boon for the US Economy. While Comic-Con failed to earn their $40 from my ticket, they are, in fact, a well-greased money printer. They charge an average of $22 per square foot of booth space, and the convention center has about 600,000 of those. Even with a 30% margin for walkways and volume discounts, we are still talking about millions of dollars (not to mention the tons of advertising and cross-promotions). I would certainly hope that Comic Con will find a way to allow everyone to attend, but until then, they’ll have to deal with the results. This makes it sound like some kind of driver or firmware problem, but don’t run off installing software, because it won’t help. The cause of this issue isn’t in the software, but due to the way the docking station is designed. You see, even though the docking station has 2 DVI ports and a VGA port, it can’t put a picture out to all of them at the same time. You can output to VGA+DVI or DVI+DVI…but that means turning off the laptop’s own LCD display (in other words…two screens together and no more). 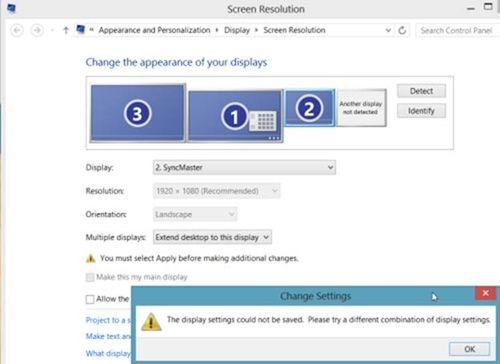 If one or more of your monitors is new and has a built-in DispayPort input, then you can hook it up to the Docking Station’s DisplayPort, and then you can use 3 monitors (the built-in LCD, one DisplayPort monitor and one DVI/VGA monitor). Using the DisplayPort output, you can even hook up 4 screens (the HP’s LCD, two DisplayPort monitors and one VGA). So, HP were able to shave off $5 off the cost of your $2000 computer and prevent you from using a 3rd screen, and to make it worse, make their documentation virtually impossible to understand this simple fact. I’m not sure who’s responsible for the meaningless message about the settings that cannot be saved, but that sure doesn’t make me feel better. At least now we know what to do…either get DisplayPort capable monitors, or the active adapter! Ever wanted more than three rows on your Surface RT? 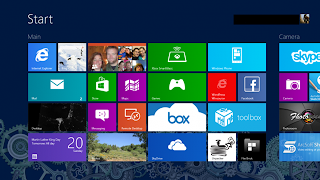 Four Tile Rows Surface RT has been a way to do it, although it resets to default as soon as you turn your screen off. Not perfect, seeing as it’s only a very temporary solution for this dilemma. Thankfully a permanent solution is available. Alternatively you can download this .reg file and run it, followed by a quick reboot of your Surface RT. Also, this will make your on-screen keyboard slightly smaller, but it is just as usable. If you ever want to restore your 3 rows you just need to go in to the registry editor and delete the registry key, and restart the device again. I assume this will work on any Windows RT device, but I haven’t tried it on other than the Microsoft one. Hit up the source link for all the original instructions. For someone who types a lot like me (I’m an author), a keyboard is a tool of critical importance. I need the keyboard to be responsive, fast and lead to the least amount of typos. For years, I’ve searched for the best possible keyboard, and these are not easy to find. Many people agree that the current line of Apple keyboards are amongst the best, and when they came out, I used one for a while, but the unusual key layout they have (with the apple key where I’m used to have the ALT key) kept throwing me for a loop. Even though I was able to use a keyboard mapping software to replace them, I was still having problems when connecting to other computers via Remote Desktop, so I was looking for something else. Eventually, I found two other keyboards that provide for a comparable experience. The first is the Sony keyboards. These have the same conceptual design as the Apple (often referred to as “Chiclet”, although that’s not completely accurate), but it’s a Windows keyboard. These are actually quite hard to find, as Sony doesn’t sell them to the public. They are typically provided with Sony’s All-In-one computers. You can trick Sony into selling you just the keyboard (if you claim to have their computer, and your keyboard broke…they will sell you one as a replacement part), but that will be VERY expensive. These do occasionally come up on eBay, though that’s also hard to find, as if you type “Sony keyboard” on eBay, you’ll get thousands of keyboards for LAPTOPS. To find one, you can try a more specific combo, such as “Sony wireless keyboard”, or “Sony USB keyboard”. You might also be lucky enough to find one by searching for specific models by model number. These are sold under various model numbers such as VGP-WKB5JP, VGPWKB5JP, VGP-UKB3US and VGP-WKB5US. You might also find one by typing “VGC-JS series keyboard” or “VGC-LS series keyboard”. A keyboard that’s easier to find, and has some advantages over the Sony is the HP Elite 2 keyboard. These are only available as a wireless keyboard (which means lesser security, as well as battery replacements), but are relatively cheap at less than 30$ right now. Another advantage the HP has over the Sony is the key layout. The Sony has an unusual arrangement of the arrow keys on the right, which can take some people some time to get used to, while the HP’s arrangement is classic 106. The guide to Naturalization…final piece. The final piece in the naturalization process comes after passing the naturalization ceremony and getting the citizenship certificate. Now’s the time to get your passport, so you can travel the world as an American. 2. Full name, maiden-name, and birth date of both your parents. 1. Passport book (which is what most people have, and is what you need to travel to Europe and most of the rest of the world. This costs $110. Let’s say you opt for a passport book only – that will set you back $135 (110+25), but note that you need to pay the fees separately. The execution fee is for the body that takes your application (like your local courthouse) and the rest is for the department of state. Checks are accepted almost universally for this, and some places accept cash, but most don’t take credit cards. I strongly advise bringing ALL three payment options in exact change with you, and bring your whole checkbook, not just pre-written checks. The last thing you want is to wait half an hour in line only to find you miss-wrote the number or payee name and have to come again. Officially, it takes “6-8 weeks” to get the passport, but unofficially, it’s a lot faster. In my case, the passport came in the mail 13 days after I filed the forms…less than two weeks. However, since you’re actually *stuck* in the US until your passport arrives, you might want to file your request with expedited service, which is an extra $60. With this, the processing is almost instant, and the passport is delivered to you in 2-3 days. Another thing to consider at this point is name changing. In the previous guide I mentioned that you can have your name changed, if you want, as part of filing the N-400, but in some cases, that doesn’t work. In my case, for example, it was denied because the USCIS office in Seattle doesn’t have a judge, which is required to sign the paperwork and approve the name change. Instead, I filed for a name change in my local courthouse, which is also where I filed for the passport. It’s important to do the name change BEFORE getting the passport, because if you did it the other way around, you’ll have to get a new passport with the new name…and pay the passport fees all over again. Changing your name is simple and easy – you just fill a form with all the details, and pay the fee, which is $130. The court clerk feed the data into the computer and verifies it with you (to make sure there are no spellers) and submits it to the judge for approval. Depending on the size and schedule of the court, it might take a few hours until they get the judge to sign – sometimes overnight if you came in late in the day. When you come back, you receive a document that certifies the change. This is VERY important, so keep it well protected. You can also purchase additional copies at $5 apiece. When you file for a passport (typically as soon as you get the document…), you will submit it with your application to show that you changed your name from what appears in the naturalization certificate.